Toronto’s Celtic rock fusion heroes have been rocking the scene (and the continent) since 1996, using a wide range of influences, and instruments to create some delightfully engaging celtic rock. The name is in many ways, a reference to the groups diverse influences, in the Haggis being a food made up of many different things. That said, what you get from the beginning is a band not afraid to experiment, but whose influences remain clearly visible. The group doesn’t have a tiny discography either, over the past 15 years, they have delivered 5 full length albums, 2 live albums, and 2 live DVD’s. This is on top of regular, active and impressive touring, which has slowly begun to move them into the public consciousness. I do not have any of the live material, nor have I seen them live, so I will stick to the LP’s as usual. With that caveat, I would like to add, I found them quite by accident playing Demonoid Roulette (type a random word into demonoid, choose music category, hit search…check out the interesting hits. I got these guys with the word Haggis) and am still startled that I had never heard of them before. LOVE the internets. The albums image encapsulates its sound rather spectacularly. Released in 1998, the album is laden with Celtic worship it’s like a thick irish or welsh cheese…probably sheep’s milk; pungent, tangy and strongly Gaelic. The albums intro, Enter, is a bag-pipe dominated instrumental little rocker reminiscent of early Pogues, or Dropkick Murphy’s, which is followed up rather gently by the soft, almost pop-rock Where Will You Go.Light, with acoustic guitars, and softer piping, it makes use of multiple instruments in a very subtle and endearing manner. By Bagpipes on Mars, you will be either a fan of their cheerfully deviant brand of Celtic-rock or disinterested. But hang in there, things are getting weirder. Bagpipes on Mars is just downright bizarre, with hints of southern folk and early newfie rock, and one downright amusing set of lyrics. Of particular note is the track the Three Little Jigs. It is what it sounds like, and if you have any appreciation for a well played Reel, then get out of your chair, turn up the volume and prepare to kick your heels up. The albums finale, the Mexican Scotsman is…heh, well; It’s a 3 and a half minute, droll tune, that rest strongly on the piper’s skills, but is none the less very, very engaging. This is followed by a 7 minute silence then a goofy little ditty at the end. Released in 2001, Aerials, is from the beginning a stronger, more aggressive album. The production is sharper, the vocals are louder, the guitars lower and the bagpipe is blended in rather than being the dominant instrument. From the opener Sunburst, through to the albums finale Icarus, Aerials is a very intense affair and deserving of being blasted through high quality speakers, loud enough to dance. Among the tracks, I have three that particularly deserve attention: Andromeda, track three, a smooth, vocal driven alternative almost-ballad. 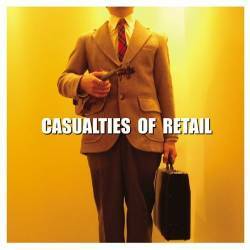 2004, and the band drops their third outing, Casualties of Retail, strong, if not brilliant, Casualties of Retail loses none of the bands energy, nor deviates very far from their formula. It is an easy listen for fans of the bands sound, and is neither challenging nor amazing. Though the album is one of my least favourites in the discography, I would not call it bad. Just, not very exciting; That said, there are a couple tracks that get me grooving, including the hyper and invigorating Twirling Towards Freedom. The rocking and sarcastic Martha Stuart is yet another worthwhile work, with wickedly mischevious fiddles and a campy rhythm to go with it, accompanied by mocking electric guitars. Loud and proud, to be Celt. 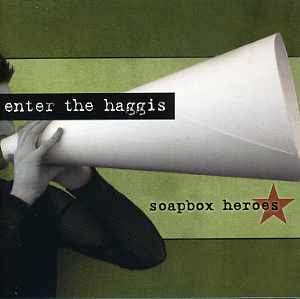 Soapbox Heroes, the bands 4th studio album, released in 2004, is a harder hitting album from the start, comin in at just over an hour with 10 tracks, the album wastes no time on filler and delivers ten, solid and impressively energetic tracks. The Guitars move further up, playing counter-point rather than support to the fiddle more often, and there’s a strong maritimer wash over the album: stronger than usual that is. That said, I am not sure any albums particularly jump out. It is a strong, cohesive album with no real stand-out moments. 2009’s Gutter Anthems is in fact, my introduction to the bands music, and frankly, it remains my favourite for a number of reasons. The album reminds me of Great Big Sea at times, like the Pgues at times, and it retains that strong personal sound the band has developed over the years. There are some truly out-standing tracks, like the highly intelligent and thought-provoking DNA, which makes use of the interplay between guitar and bag-pipe the band has mastered; unflinchingly clear-eyed, the lyrics roll from his throat crystal clear, and high light the truth of childhood. There’s the maritime washed Noseworthy and pierce, a newfie ballad delivered with gusto and pomp. Piano’s dnace across the track with a spidery grace and the soaring guitars, pounding drums and wailing bag-pipes bring the whole track to a stupefying crescendo. Ghosts of Calico, is, wow; subtle, penetrating, rocking and intense. All at once. As I said, easily my favourite Enter the Haggis album, and I recommend it to all lovers of good rocking celtic music, and Canadiana. As always, if you like what you hear, buy an album, buy a shirt, go to a show, pass the sound on. Good music is meant to be appreciated. Formed officially in February 1992, the Darkest of the Hillside Thickets are many things to the western Canadian music scene. They are legendary geek-rockers who have blazed a Lovecraftian trail through many styles of music, they are hard-rocking costumed performers, who have toured with the likes of GWAR, MC Lars, They Might Be Giants, Nomeansno and others, they are geek icons involved in many levels of nerd-dom, from RPG’s to podcast shows. The Thickets (as they are often called to shorten it up), have been making music since they released their first 3 song cassette (50 copies) out to friends back in 1992. 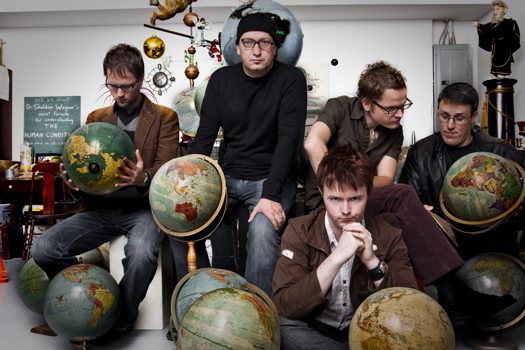 Over the next 3 years, they would record a bunch of songs, and get included on a number of compilations, while the group itself fluctuated in size and membership, though, at the core has always been Toren Atkinson, Warren Banks and (after a year and a half of going through drummers, finally settled on) Jordan Pratt. By now (2011), the group has changed a number of times, they have dropped 4 full-length albums, played the Penny Arcade Expo and its predecessor Necrowombicon, and begun to start earning their due recognition. The bands second album, released the next year is entitled The Great Old Ones, and it carries on in the same manner. The album has a similar feel to it’s predecessor and this is not surprising considering it’s a compilations of demo tracks, live tracks and a few newly recorded tracks at the albums end. From the beginning you are treated to the same brand of simple-seeming punk songs, twisted around fantasy, sci-fi and horror themes, then delivered with a pop sensibility coating. Take for example the bounce-inducing anthem, Colour Me Gree; an ode to the Cthulhu mythos, and a truly pounding punk track that turns crowds into a frenzy of rhythmic bouncing and singing along. Or the delightful Big Robot Dinosaur, a tale about a tortured young geek in school, and the revenge he and his father enact on the world in their Giant Robot Dinosaur of destruction. There are two versions of the track Digging Up the World, of which I much prefer the haunting and strangely calming acoustic version. There’s the brutally grim yet cheerful Mustard Gas, a song that will burrow into your brain and leave you humming it for days on end. In short, this is the kind of album that any fan of fun engaging music with a sense of humour and nerdiness should be finding, despite being more of a B-sides album. Geekrock for sci-fi RPG's...? Yup. The band did not release another album until 2001, but there is no question that the 5 year wait, was more than worth it. Spaceship Zero, is the soundtrack to the independantly released RPG of the same name (courtesy of Toren Atkninson amongst others) and if you are ever in Vancouver and want to get yourself a piece of geek history, stop into one of the local used bookstores (or game-shops) and see if you can snag a copy. Better yet, as the book is still in print, order a new copy for yourself (www.greenronin.com). The album opens lightly, with the primarly instrumental title song, but is followed up immediately by one of the bands more famous tracks; 20 Minutes of Oxygen, a depressingly awesome song about dying because of a bad decision, which includes some truly catchy guitars and driving drums. Immediately after, you are seranaded by the bizarre Innsmouth Look, about going on a date in the demented town of Innsmouth. There’s the stand-out Math Song, which delivers a love-song in a very unique way, and reminds you that ‘you have a brain/and no one really needs another love song’. The album is flat-out full of hard to hate tracks, such as the truly addictive The Chosen One, which includes some plunky bass, stampeding drums and pulsing guitars, and a prophecy of sorts. The albums finale, End Credits, is an electronic instrumental that demonstrates how impossible it is to pin the bands sound or influences down. An homage to the master of horror. It took 6 years for the next album to the see the light of day, and the care and attention shown exceed any expectations. The Shadow Out of Tim is a tour de force of surf-punk, metal, rock and experimental/avant-garde moments. Lyrically, Toren has out-done himself, providing a poetic, evocative and occasionally chilling twist on the Lovecraft tale, The Shadow Out of Time. Musically, the rest of the band have delievered like never before. The album opens with a psuedo-primitive chant, complete with skin drums and vocal harmonies. It’s a feint, an opener that leads into something very different. Track two starts with a ripping guitar piece, and becomes a tale that opens up the rest of the album; entitled A Marine Biologist, it introduces the albums protagonist (Tim). The third track, Blackout, was nominated for an independent Music Award, and with damn good reason. Blackout is pounding, dark, depressing, catchy and surreal. Toren’s lyrical prowess is truly on display, while the drums and guitars truly lift him up and hold his unique voice out for admiration. There’s the fascinating Return to Melanesia, which starts out with a neat whistled piece, which turns into a vocal chorus backed by some very subtle instrumentation, and another demented piece of the tale. Its hard not to gush on and on about the brilliance of this album; this is a band at 15+ years experience, taking their time and crafting a real masterpiece. Not. To. Be. Missed. Over the past 4 years, they have released two other tracks from the Shadow Out of Tim sessions (Shhh, and (We’re Gonna) Kill the Chupacabra (Tonight)), and from what I have been told, working their way into a new album. Given the bands attention to detail and care, the wait is pretty much guaranteed to be worth it. As always, buy merchandise, see their shows, send them messages telling them how awesome they are. Support your independent bands.